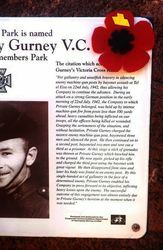 A park commemorates Arthur Gurney who was awarded the Victoria Cross (V.C.) during World War Two. A plaque commemorates the 50th anniversary of World War Two and those who served in that conflict. Arthur Gurney was born on the 15 December 1908 at Day Dawn. Before the World War Two he was a professional cyclist and worked at the Perth Electricity and Gas Company. He joined 2 / 48th battalion in Tobruk and was part of an attack at Tel el Eisa that was pinned down by enemy fire which killed every officer in the company. Private Gurney charged the nearest enemy machine gun outpost and bayoneted three men. He then continued to a second outpost, bayoneted two men and sent out a third man as prisoner. At this stage, grenades were thrown at Gurney which knocked him to the ground. He picked up his rifle and charged the third outpost with his bayonet. He disappeared and his body was later found in an enemy outpost. For this heroic action he was awarded the Victoria Cross. Arthur Gurney is buried in El Alamein War Cemetery. 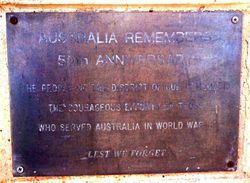 The people of the District of Cue remember the courageous efforts of those who served Australia in World War II.